Island Batik Four Seasons Blog Hop and Giveaway! Hi and welcome to the first day on the Island Batik Four Seasons Blog Hop! Today’s featured Island Batik collection is called Blue Moon, and it's simply wonderful! 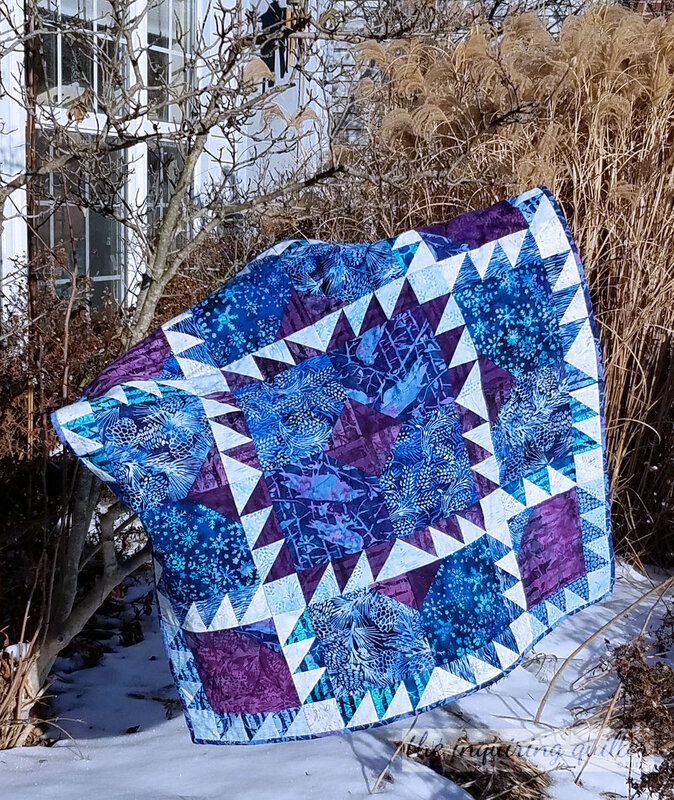 Blue Moon is part of the Winter collection, and you'll find it in quilt shops beginning this month (January 2018). The icy blues and purples in the Blue Moon collection made me think immediately of a snowy forest in winter. I considered many designs for my quilt, finally deciding on this Bear's Paw variation. After putting the top together, I kept thinking of a snowy forest, and the light filtering down from a full moon. I call my quilt Freshly Fallen. I played with the idea of adding a border, but finally decided it didn't need it. For quilting, I used a large loop design for the big square in the block, and a simple curved outline for the HSTs. For the corner triangle in the block, I used a backwards question mark design. I quilted each block the same, which made the quilting go pretty fast because I had a firm plan. I'm coming down with the flu or something, so my husband and daughter kindly took my quilt outside for these photos. I gave them a list of some of the shots I wanted, then told them to play. Didn't they have fun? Please visit Cheryl @ Cheryl Lynch Quilts, who is also featuring the Blue Moon collection today. My first year as an Island Batik Ambassador is at an end with this blog hop, but I'm excited to announce that I'm going to continue as an Island Batik Ambassador for 2018! Be sure to follow me if you'd like to see more projects featuring Island Batik. You'll find ways to follow me at the top of my sidebar. Click here if you'd like to see my past Island Batik quilts and other quilts finished in 2017. To celebrate the Island Batik Four Seasons Blog Hop, I'm having a giveaway! Leave a comment below to enter to win a lovely charm pack from the Blue Moon collection by Island Batik (US residents only). The giveaway is open through the blog hop, and closes on February 1st at midnight EST. I'll announce a winner on February 2nd. For International residents, the prize will be one free PDF pattern from my shop. I'm sorry I can't afford the cost of shipping overseas, but I wanted everyone to have a chance to win something. Thanks for stopping by and please leave a comment to enter! Use the Rafflecopter below to enter the Island Batik giveaway! Up for grabs are four precuts from the collections featured during the Four Seasons Blog Hop. So you have four chances to win! The blog hop continues through Feb 1. Be sure to visit the other Island Batik Ambassadors each day and see even more beautiful Island Batik fabric collections! There are additional giveaways, free patterns, and tutorials so be sure to visit each stop on the hop. Tell me...what's your favorite Wintertime memory?